Do You Have A Stressed Vicar? Are you a Vicar that gets stressed easily? Do you get worried about your Vicars stress levels? Please let us know if it helps you and your resident vicar. When The Vicar Visits. A Checklist. For some random reason, you have the vicar coming to visit, and if The Simpsons have taught us anything, he’s not a normal house guest. He’s the vicar! 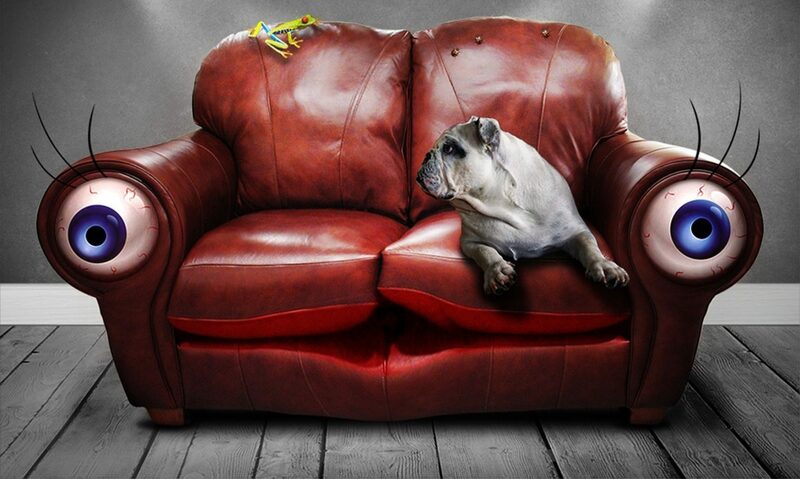 So what do you need to do to bring your house upto scratch? Check our “Vicar coming to visit” checklist, to make sure everything is done. Give the place a quick clean. Actually quite nice to do this anyway. Open a Bible, leave it open somewhere. Christian music. Something recognizable, Graham Kendrick would probably do. Christian music not option? Stick something gentle on in the background. Classic FM would do. Hide the Harry Potter DVDs. Hide the empty wine / beer / vodka / whiskey / miscellaneous alcohol bottles. If needed, try selling them. Make sure the book shelf has the “Christian” books at eye level. No Christian books? Put some nice cookery books on eye level. Maybe put “50 shades of Grey” to one side. Any more that should be included? Christmas Present Ideas For A Vicar? Everyone knows that church leaders get stress around Christmas, with all those carols to be sung, and mincepies to be eaten, some stress is understandable. Help them manage the stress, and take that stress out on Santa by giving them the gift of Santa Stress Balls . Yes, they’re cheesy – but its Christmas! 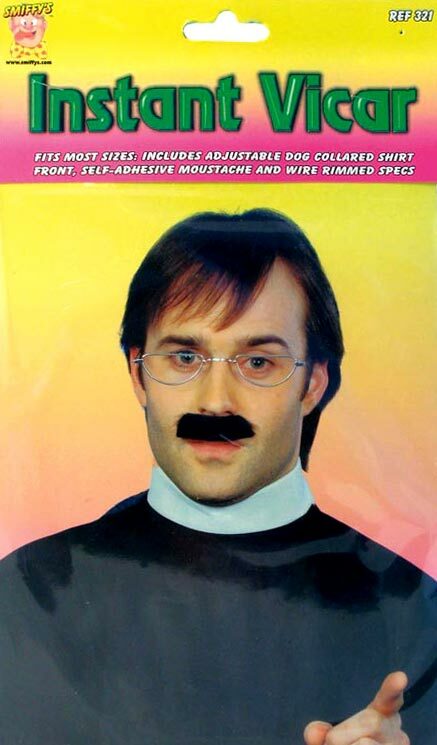 And yes, I guess it will only work as a gift for people who wear ties. EVERYONE knows that Church leaders LOVE Bibles! Obviously the perfect gift would be Jesus!! Jesus, is also available from Amazon. What other presents would you suggest? A couple of weeks ago, The Sofa featured the story of a Church that made a nice cheery video to say goodbye to their vicar. That got us thinking, what other ways are there for a church to say goodbye to their vicar? This list might be a little inspired by Youtube. Shoot the vicar from a cannon? Blow up the pulpit as they end their last sermon. Go back, change time, so they never come to your church. If nothing else, send them away with a song and a dance. A Present for a Stressed Vicar? Do you know a stressed vicar? Do you know a clergy member who could do with calming down? 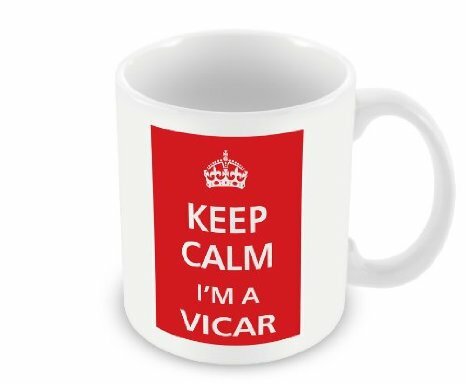 How about telling them to keep calm and vicar on, over a mug of tea? Something For The Vicar In Your Life? We’ve looked at a few Christmas presents over the last week for the different people in our lives. What about our local Vicar / Priest / Minister / Other Person with Dog Collar ? Well, its Christmas, and ministers are busy people at the moment, with Carol Services, Sunday Services, Special Assemblies, Random Christmas Gatherings, and Carol Services to get to. (I realise I said Carol Services twice, but I figured there are so many going on, it was worth mentioning twice). Help your minister get to every event he needs to, by buying them a spare minister “Inflatable Priest“. This way they can have a spare vicar figure at hand if they need to send a replacement at short notice*. * Obviously you’re hoping that people cant tell the difference between their vicar, and a big balloon. 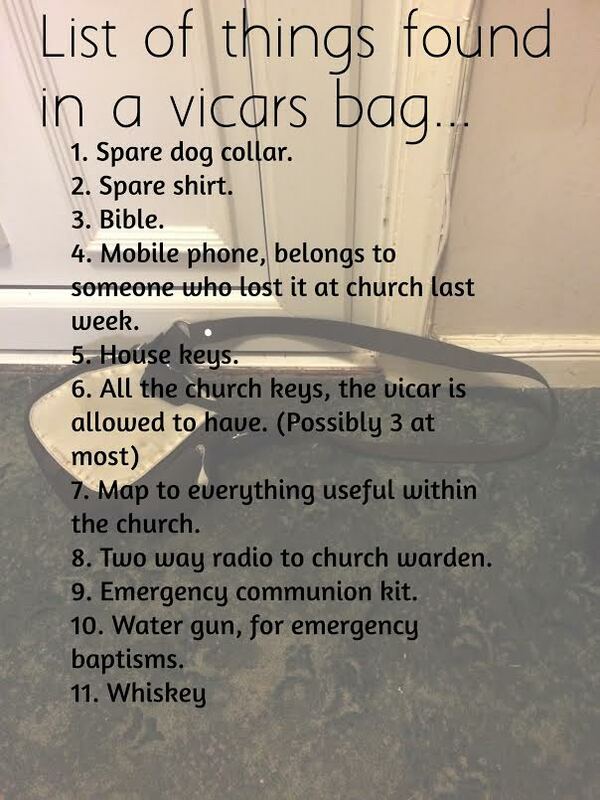 What can be found in a vicars bag? Nows your chance to be a Super-Church-Hero! Grab your handy Instant Vicar Set , put on your dog collar, and save Sunday by leading the service!